To many, Seiko is synonymous for their functional yet affordable timepieces. But at the top end, they have the Grand Seiko line, first introduced in 1960 and in 2017 became a brand of its own right. Grand Seiko has relentlessly pursued the idea of creating the perfect wristwatch. The subject of our discussion is the Grand Seiko SBGX069 / SBGX269, with the 9F quartz movement, and we think they might just have succeeded. The SBGX069 (pictured here)/SBGX269, with the Grand Seiko calibre 9F. Disrupt or be disrupted: it seems that innovation paves the way forward. And no one does innovation better than Seiko; they’re the forefront of technology intensive and value-added timepieces. In 1969, Seiko released the revolutionary Astron: the first production quartz wristwatch, beating the Swiss at their own game. It sold for ¥ 450,000, which was roughly equivalent to the cost of a Toyota Corolla at that time. It was a lot of money, especially back then, partly due to its massive development span of over 10 years. This resulted in poor sales, with only 200 produced. However as with any technology and time, industralisation followed. This caused prices to fall and soon quartz became the choice of the masses, upsetting the Swiss watch industry. This was the phase which we now know as the Quartz Crisis. The release of the first Grand Seiko Calibre 9F in 1993 created a big buzz among collectors. By then, quartz has become a more affordable alternative to intricately handcrafted, handsome mechanical movements. And to many, the idea of a high-end quartz watch may seem absurd; a paradox. But when a brand is adamant in their pursuit for perfection, we pay attention: the calibre 9F may very well be the best quartz movement ever created. 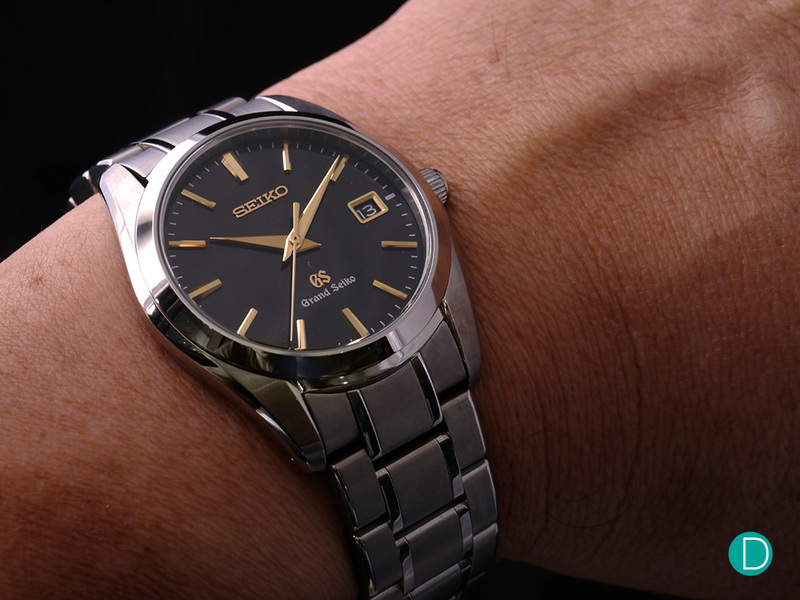 As a case in point, we consider the Grand Seiko SBGX069. 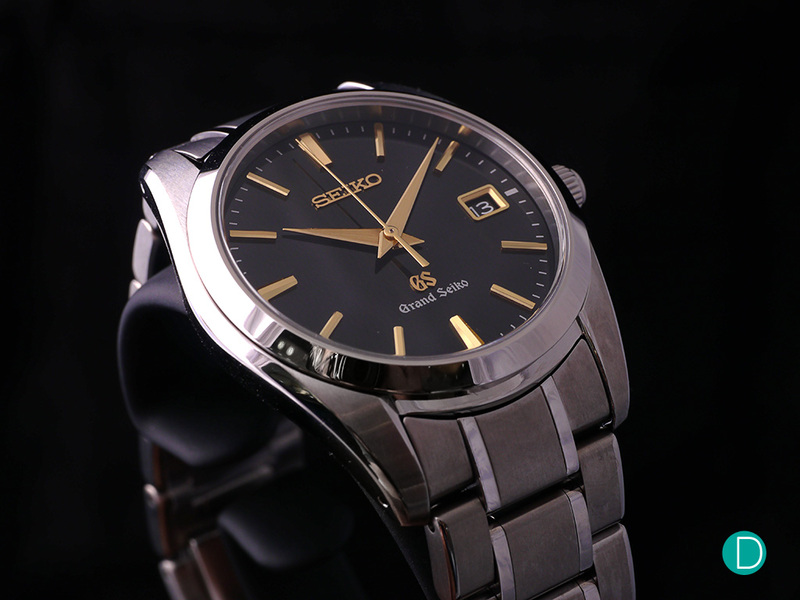 This model is now renamed SBGX269 with the Grand Seiko branding, but is essentially the same watch. We shall start with the movement. 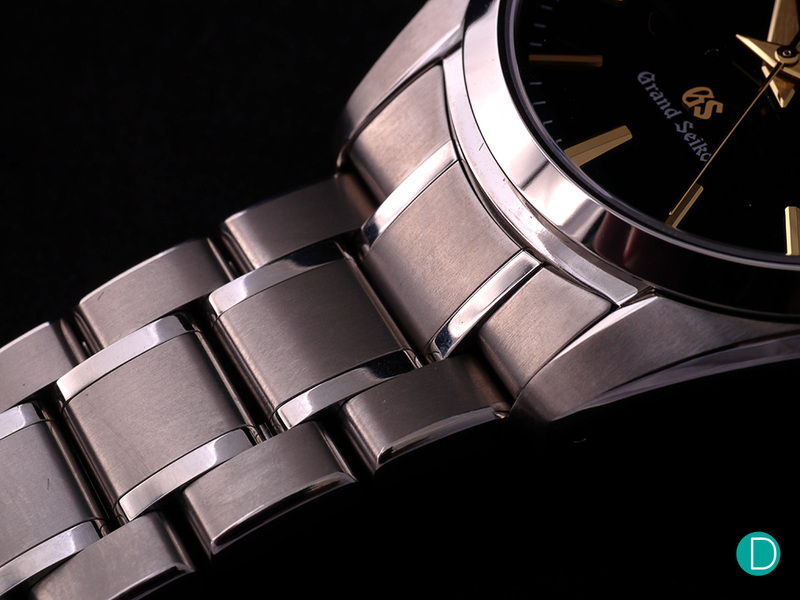 As with all modern Grand Seiko Quartz watches, the SBGX069 uses the manufacture Calibre 9F. The 9F is a product of the Seiko Epson based in Shiojiri. 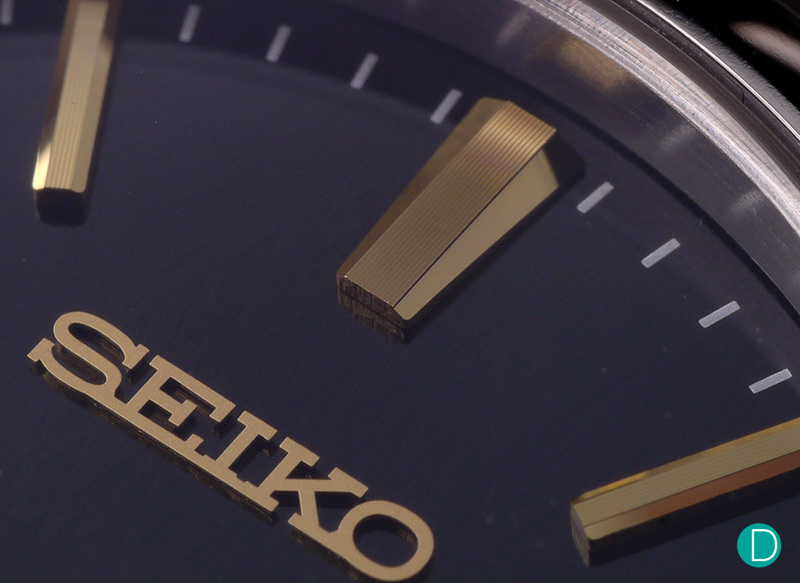 For a more in-depth look at the two Seiko manufactures, please see this article here. The SBGX069 / SBGX269 features the calibre 9F62. As the SBGX069 does not have a display case back, and we did not open the case back, we could not examine the movement during our hands-on session. But we do know how the movement looks like as our Chief Editor have examined it during his visit to the factory. 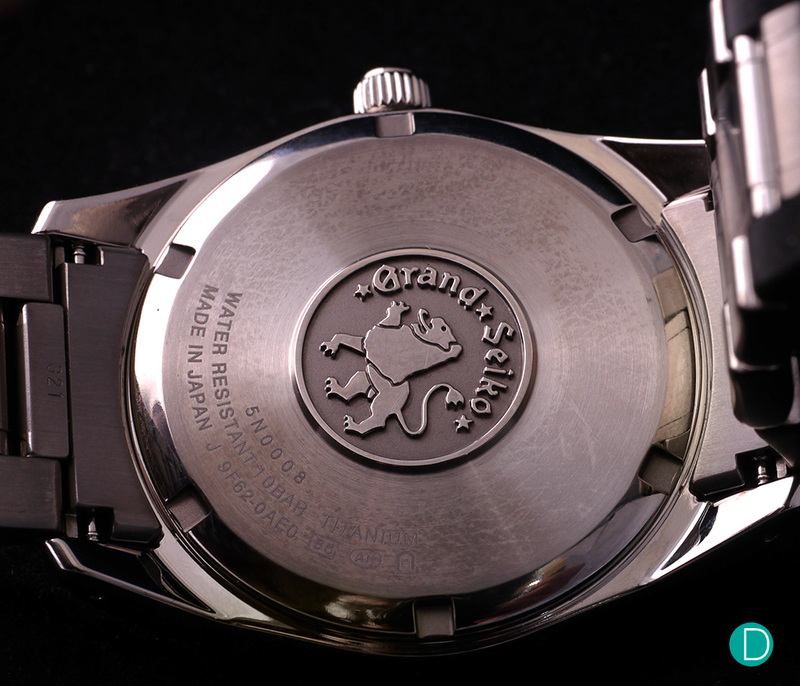 The Grand Seiko lion graces the solid case back of the SBGX069. 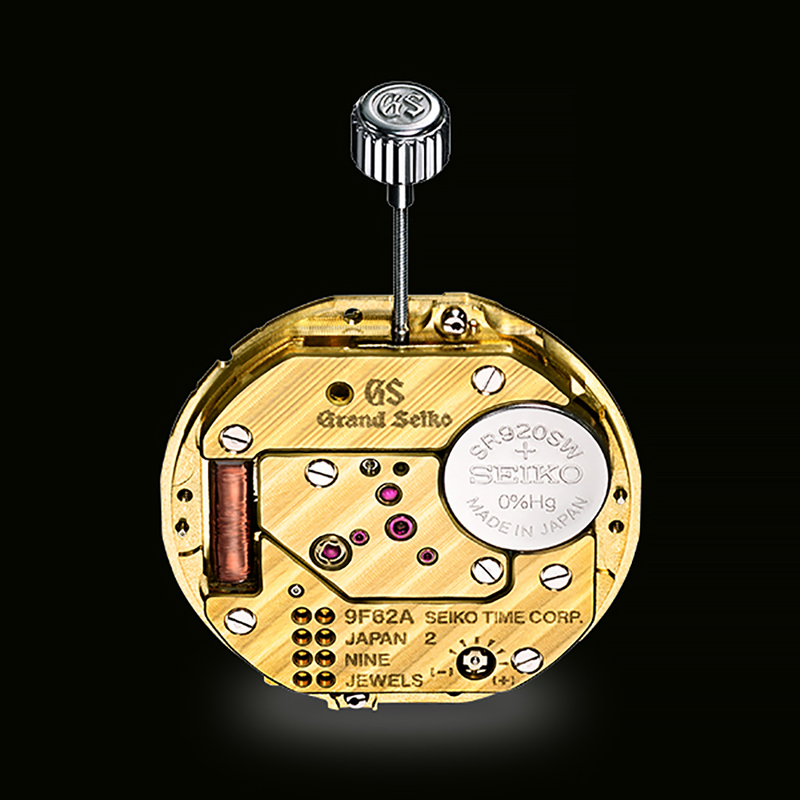 The lion represents Grand Seiko’s commitment to be “King of watches”. Unlike the industrialised robotic assembly where most quartz movements are made, the 9F is hand-assembled, hand-finished and hand-decorated. Built more like a mechanical movement with only the visible battery and coil serving as a reminder of its electronic heart. The 9F looks the part of a proper haute horlogerie movement. The impeccable finishing and detailing on the calibre 9F by Grand Seiko. So it is safe to say that the 9F is not your typical quartz movement. It also contains more components than a generic Swiss automatic movement and built to a higher standard. The assembly requires the talent of 2 expert craftsmen – one to assemble the movement and another just to install the date indicator. This perfectionist mindset is exercised right down to the installation of the hands. 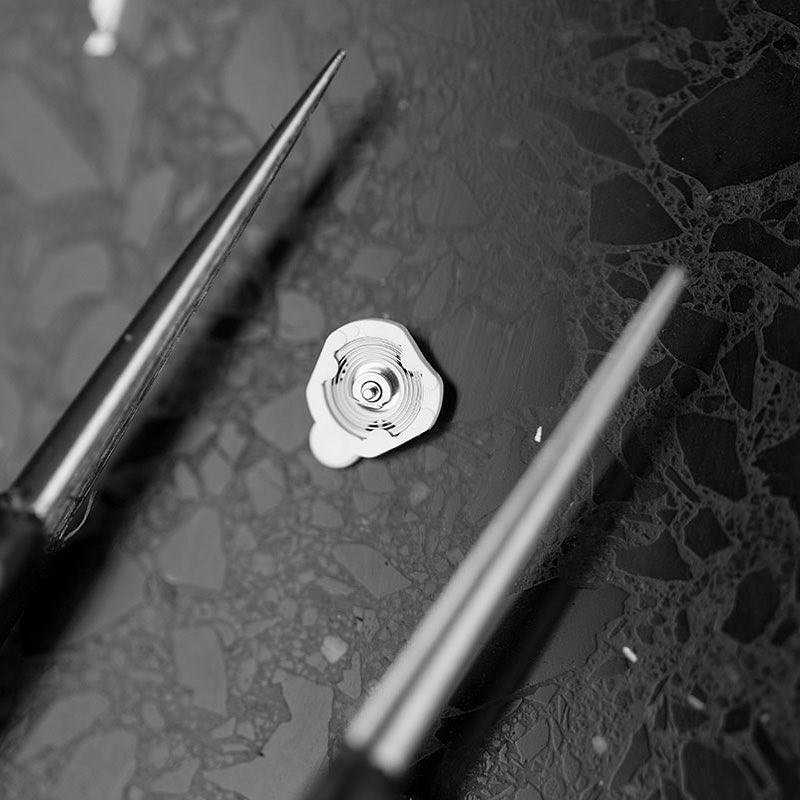 With a mere 0.2mm separating them, only the most experienced craftsmen are entrusted with this detail. Every single component of a Grand Seiko right down to the installation of hands and date indicator is done with a perfectionist mindset. The attention to detail is manifested even in the minute details. Seiko’s quartz crystals are grown in-house, with only the purest selected. To ensure consistency in its performance, each individual crystal is aged for up to 3 months, and, paired to a temperature sensitive integrated circuit that adjusts its frequency 540 times per day. The result? A guaranteed class leading performance of +/- 10 seconds per year. True that this level of performance is not the best in the world, but it is extremely good, and achieved by only a handful. The in-house grown quartz crystal on the left, paired to a temperature sensitive integrated circuit in the middle. This results in a guaranteed accuracy of +/-10 seconds per year. Picture credit: Joe Kirk. Note that the photograph is made on a sample movement, solely used for demonstration. The photographs are used with permission and taken from Joe’s Instagram account @josep.kirk. Moreover, if there are any irregularities in timekeeping, the 9F can be fine tuned through its pacing switch similar to any mechanical movements. 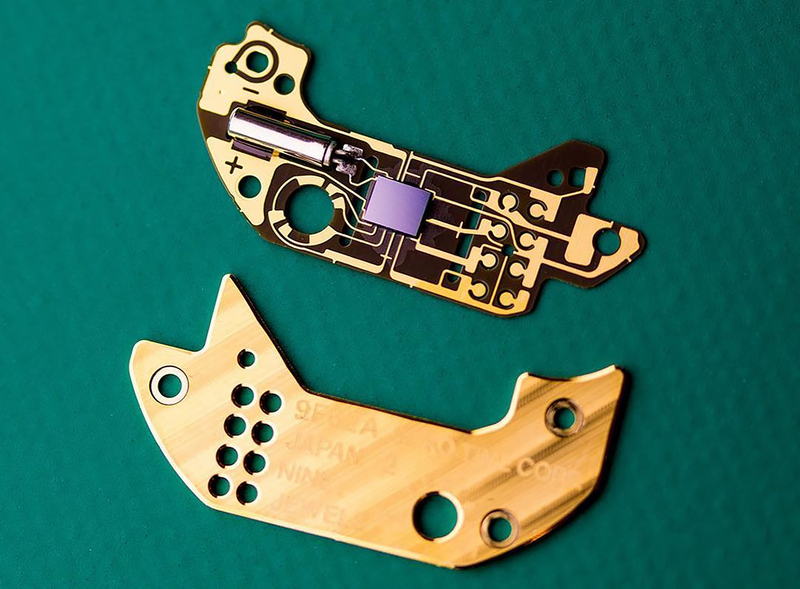 The pacing switch on the 9F allows for fine-tuning of the movement without having to enter the internals. Picture credit: Joe Kirk. Note that the photograph is made on a sample movement, solely used for demonstration. The photographs are used with permission and taken from Joe’s Instagram account @josep.kirk. What ascertains the calibre 9F as one of the best quartz movement in the world is its unrivalled 50 years’ service interval. This is because Seiko seals the movement in what they call a “sealed cabin”. What this means is that the movement is vacuum sealed within a cabin exterior. And gives it the extraordinary service interval. Probably the highest we have ever encountered. Of course this interval is theoretical. The air tight seal might preserve the lubricants for this long, but as the 9F is only 25 years old, it has not been tested yet. Seiko recommends a standard service interval of 3 to 5 years for the watch despite this theoretical service interval. We recommend only to service a watch when it is not running properly. In a typical standard quartz watch, the movement is replaced during service and not service, while the calibre 9F is designed to be serviced in the long run. The “sealed cabin” as depicted here houses two of the most important parts of the 9F: its gear train and stepping motor. An air-tight seal prevents debris from entering the movement when it is exposed. It also helps to preserve the lubricant, allowing for its unrivalled 50-years service interval. Picture credit: Joe Kirk. Note that the photograph is made on a sample movement, solely used for demonstration. The photographs are used with permission and taken from Joe’s Instagram account @josep.kirk. Another interesting aspect is the lengths Grand Seiko takes to ensure that each step of the seconds hand aligns itself to the seconds marker exactly. 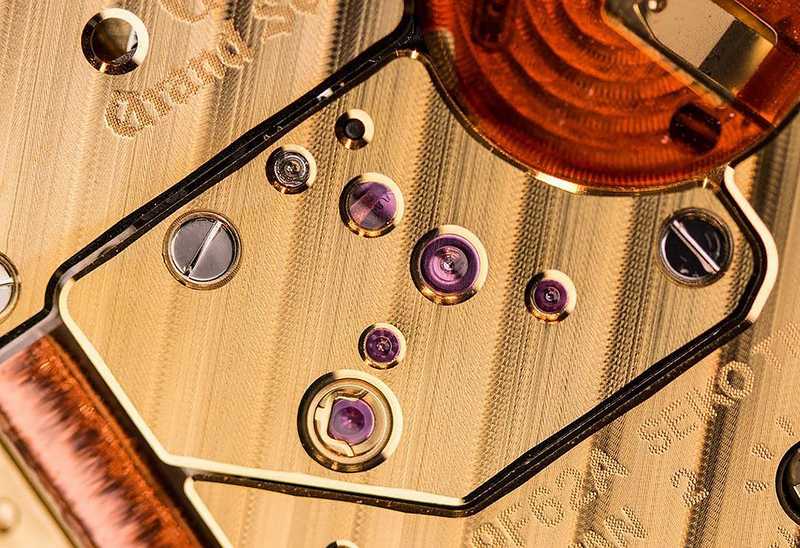 To ensure this, GS uses a special hairspring to tension to prevent backlash or vibration. The result is the 9F has a more assertive “jump” in the seconds hand. The special hairspring as depicted here is used in the backlash auto-adjust mechanism, allowing it to stabilise the seconds hand with every jump. Picture credit: Joe Kirk. Note that the photograph is made on a sample movement, solely used for demonstration. The photographs are used with permission and taken from Joe’s Instagram account @josep.kirk. Despite the performance and qualities it boasts, it still has a reasonable 3 years battery life which makes for a good daily driver. Changing the battery will not require the movement’s sealed cabin to be opened. Crafted using Seiko’s proprietary Bright Titanium alloy, the Grand Seiko SBGX069 / SBGX269 measures a comfortable 37mm diameter and 10mm thickness. 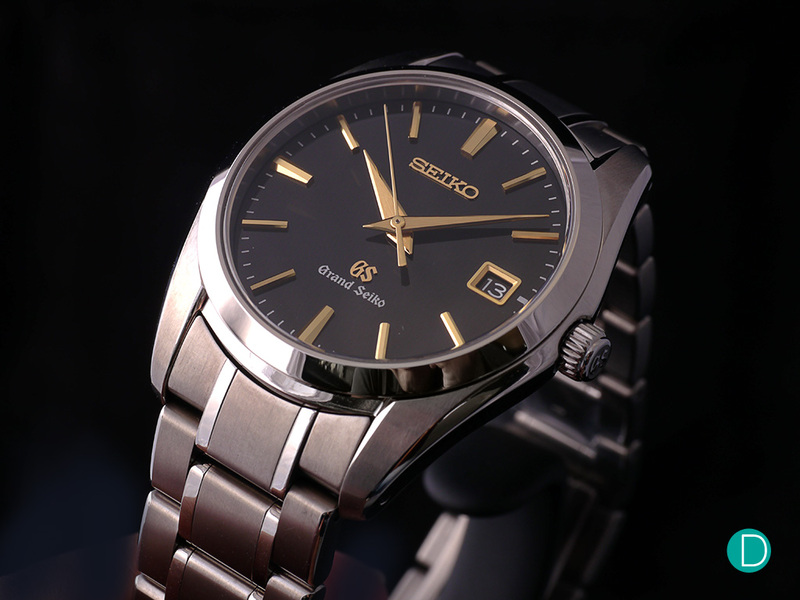 The Grand Seiko SBGX069’s Bright Titanium case measures 37mm in diameter and 10mm in height, weighing in at 79 grams. The design language used in the SBGX029 is set out in the Grammar of Design pioneered in the 44GS. The case detailing is what you’d expect of a typical Grand Seiko: a blend of traditional Zaratsu and brushed finishing. No corners were cut, with the famed Zaratsu polishing being meticulously applied to every aspect of the watch. The polished bezel and case sides, fused with the brilliant brushed lugs gives it a bright and seductive appearance. On handling the watch for the first time, it has the light (79g, watch including bracelet) yet robust feel of the titanium and leaves a deep impression. With a bracelet forged from the same alloy, it makes for an excellent daily driver. It sits well on an average wrist and is no doubt a convenient grab-and-go everyday piece; easy to slip on and unobtrusive. The Bright Titanium bracelet and case allows for a light yet robust feeling watch, perfect for daily wear. The bracelet deserves a special mention as its included half links allows for more precise adjustments, making for a more comfortable fit. The SBGX069 features an intricate and enchanting pattern imprinted on a gorgeous black dial. 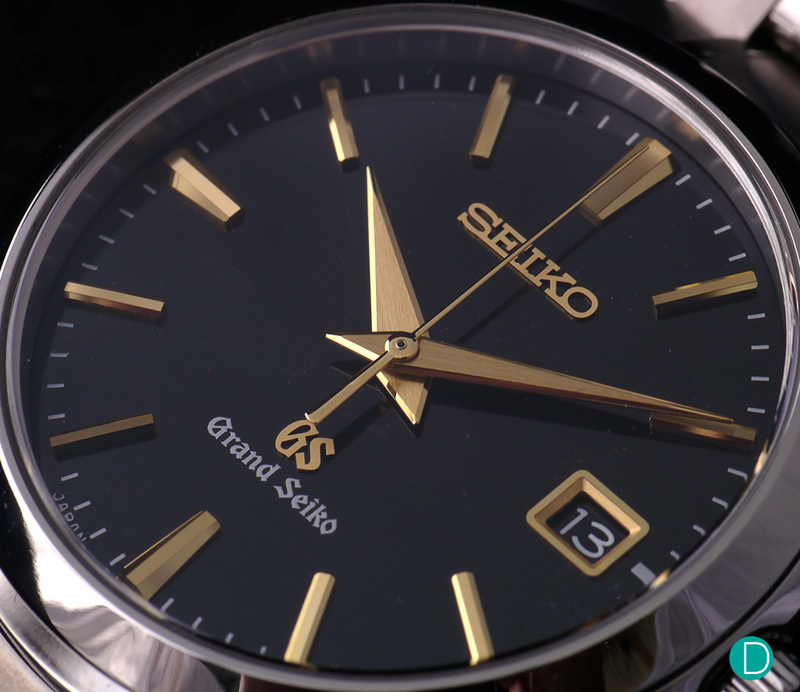 This model features the now discontinued ‘Seiko’ branding at the top, instead of the ‘Grand Seiko’ branding (announced at Basel 2017) which is on the SGBX269. Perhaps the most indispensable feature of any watch lies in its ability to tell the time. This model sports beautifully polished, consistent golden blade-edge hands. There is no applied lume, but the high-polished finish on the hands reflects light brilliantly, making time telling effortless in all but the darkest situations. The highly legible, Zaratsu polished golden hands. 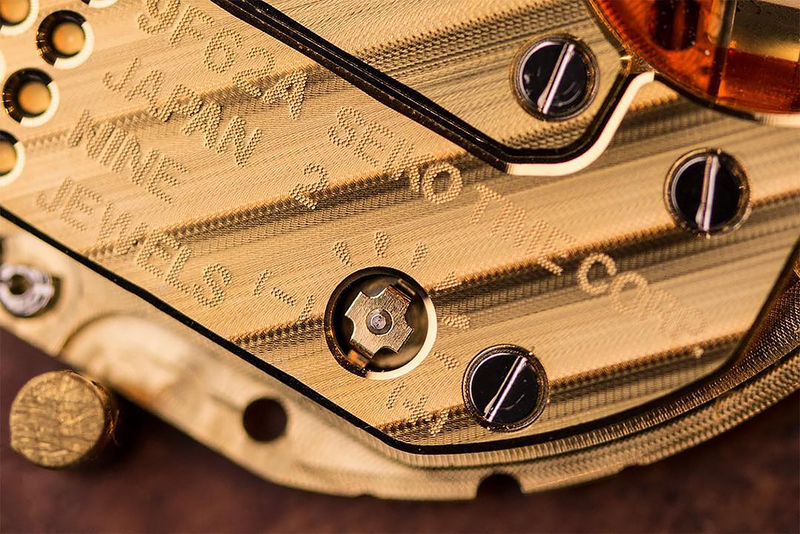 The breath-taking attention to detail extends right down to the applied gold indices: they are polished individually by hand, using the same Zaratsu technique as the case. The result is an exquisite, brilliant angular surface with high lustre, adding to its charm. And that’s just the tip of the iceberg – zoom in closer and you’ll notice the vertical stripes on each of the 11 indices. It might be a form of over-engineering as they’re barely noticeable on the wrist but serve as a true testament to Grand Seiko’s pursuit for watchmaking perfection. Attention to detail: Vertical stripes present on the zaratsu polished hour markers. The golden hands and indices contrasts pleasantly with the intricately patterned black dial, giving a sophisticated and elegant feel to the watch. Overall, the dial is clean and legible. The SBGX069 / SBGX269 is as you’d expect with all other Grand Seiko watches, built with the idea of perfection in mind. Its sleek, full titanium construction, as well as a highly legible and gorgeous black dial makes it perfect for daily wear. The quality and finishing are on par with the Grand Seiko mechanical timepieces, only it features the convenience and benefits of quartz technology. And, with the watch coming in at a conservative 37mm, it is perfect for all but the largest of wrists. 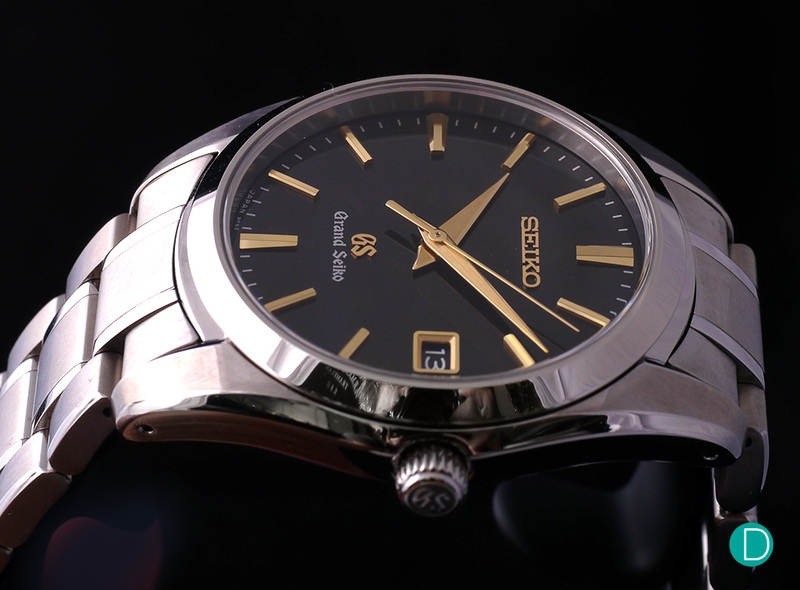 Priced at S$ 4,494 / JPY 340,000 for the SBGX069, Grand Seiko delivers a superior product with excellent value. On the wrist, the SBGX069 at 37mm makes a comfortable fit for most. Its curved end links allows it to hug the wearer’s wrist, allowing the watch to sit well. However, it might not suit the largest of wrist. In terms of competition by similar quartz pieces, the calibre 9F might be compared to the likes of the Citizen CTQ57-0953 Chronomaster, nicknamed simply “The Citizen,” or the Longines’s VHP. Both have movements which are accurate to +/-5 seconds per year, making them more accurate than the 9F. The Citizen CTQ57 is a remarkable watch, and will be the subject of an in-depth investigation. But we digress. We think, however, that the Grand Seiko is in a league of its own when it comes to fit and finish. It is able to pull its own weight, and is worth checking out. We highly recommend that you do. 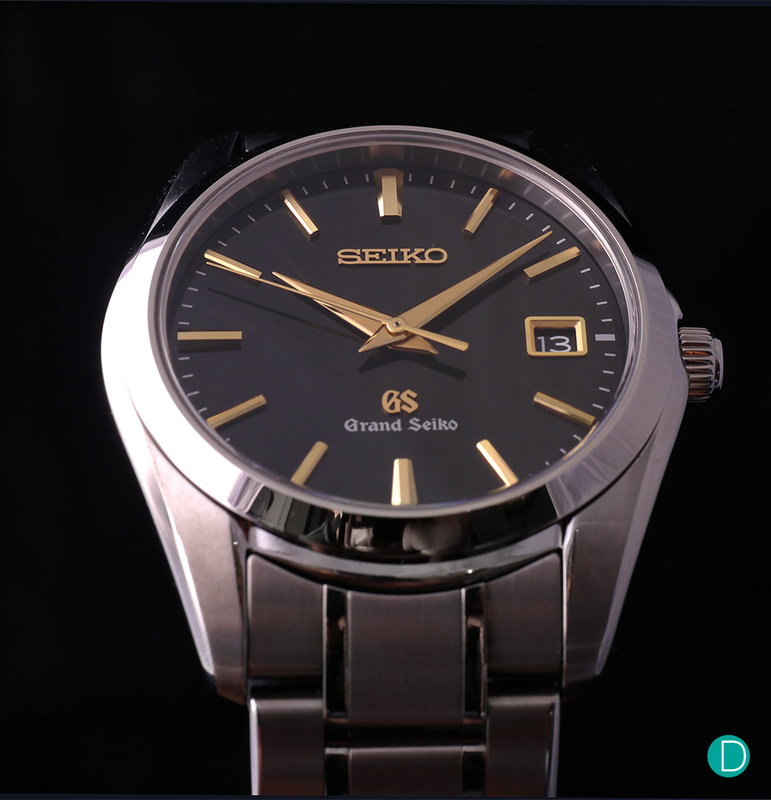 For a more on the Grand Seiko 9F, please see our article on the 25th anniversary of 9F. Edited 11:52pm 15 March, for clarity on service interval and battery changing. Edited 11 :20am 16 March, with pricing information added. Editor’s Note: Daniel Chua joins Deployant in the News Team and this is his first article which is written in collaboration with Chelsey Chen and Peter Chong. His interest in watches began at the age of 12, where he was given a Casio G-Shock. His passion in horology started after watching a documentary about mechanical timepieces, where he was captivated by their inner workings and its ability to tell time without electronics. At the young age of 15, whilst most of his schoolmates wore fashion watches, he elected for a mechanical timepiece and never looked back. As a student currently studying business, his interest centers around a brand’s history and its people. He is grateful for how approachable and welcoming the local watch collecting community is in spreading knowledge. During his free time, he enjoys meeting fellow collectors and photography, as well as a good session of rock climbing. Daniel is based in Singapore.